"The world is yours to conquer from today." As students across the world get started with the new year, graduates from our School of Night Rabbits are preparing to join the formal school system in Ghana. Thanks to supporters and our partners EMPower, 98 children who were previously living and working on the streets are now safely back home with their families and ready to go back to school; some for the very first time. At their graduation earlier this month, AfriKids' Director of Programmes, David, prepared the graduates for their new chapter. "We are gathered today to witness the graduation of 98 former street and working children from the School of Night Rabbits. "Remain determined in pursuing your dreams no matter how tough the situation will be." Our Night Rabbit graduates here today will begin mainstream education at formal school this academic year and it is my fervent hope that this will mark the start of your fulfilled educational journey, given the preparation that the School of Night Rabbits as given you. As we celebrate yet another group of young graduates from our catch-up classes, who have each been equipped with the ability to read and write their local language. I want you to be confident that you are ready and equipped to compete with your colleagues already in school. Remain determined in pursuing your dreams no matter how tough the situation will be. Great people come out of great situations and none here comes from any less great situation than you. The world is yours to conquer from today. David also recognised and thanked all the partners who have been involved in supporting our Night Rabbits. "The story of street children in the Upper East region would not have been the same without your collaboration and support." This day has been possible due to the huge sacrifices of our partners, EMpower, who strategically invest in vital, local organisations like AfriKids who work to empower youth. Let me use this opportunity to salute all those involved in this project, the GPRTU, the Department of Social Welfare, the Anti-human trafficking and Domestic Violence and Victims Support Unit both of the Ghana Police Service, the Ghana Education Service, Trade Groups such as the Weavers Association of Ghana, the Ghana Hair Dressers and Beauticians Association, the members of the Child Protection Committee established by the School of Night Rabbits to provide rapid response in the area of protection at the main lorry station in Bolga, the teachers of the schools who have volunteered their time to take care of these children and to provide lessons to them, etc. I am without doubt that the story of street children in the Upper East region would not have been the same without your collaboration and support. "Let’s work together more to keep safe our children and society." 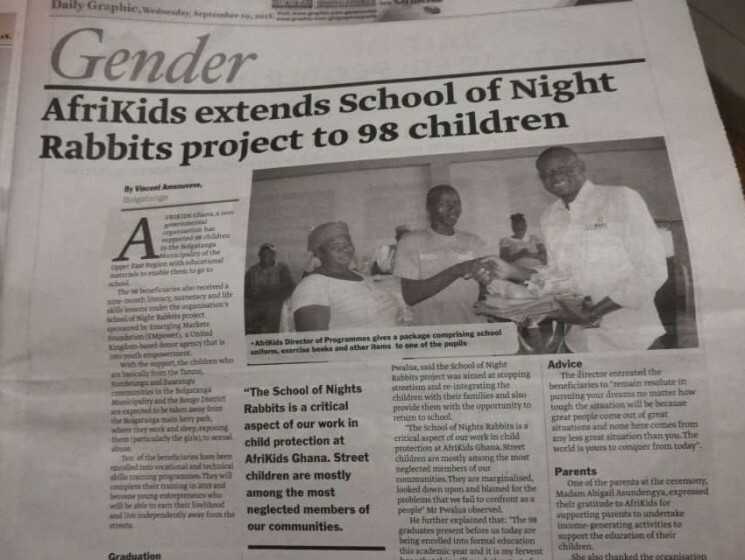 The School of Nights Rabbits is a critical aspect of our work in child protection. Street children are among the most neglected members of our communities. They are marginalised, looked down upon and blamed for the problems that we fail to confront as people. Our Night Rabbits have each received nine-month's of literacy, numeracy and life skills lessons and today they are graduating from the programme. Ten additional Night Rabbits have been enrolled into vocational and technical skills training programmes. They will finish their training next year and transition as the crop of new young entrepreneurs who will be able to earn their livelihood and live independently away from the streets. To the parents and family members of the children, it is our hope that the experiences and support from the School of Night Rabbits has prepared you to better take care of your children. Endeavour to make good use of the livelihood support package of goats and training given to you to help you financially secure the future of your children." Find out more about our work in education here. Two goats go home with every graduate so they can be bred to generate a profit. The profits are then used to pay for educational materials and uniforms.